Say hello to Peekaboo, a 4 month old #puppy! Isn’t she an absolute doll?! She was rescued after having a run in with a car. Luckily, she was not badly injured and was brought to the local vet for care. She’s a little sweetheart who loves to just hang out in a lap. Peekaboo plays well with others and makes fast friends with everyone she meets. We have such a good time together; we #laugh and play all day! I love spending time with her; she is such a great #friend and listener. Will you #adopt this sweet girl and give her the warm, loving #furever #home she deserves? If you are interested in adopting her, get at me, dawg! Comment or DM me here or tweet my Mama @kelsey_cruz. She is a @browndog_coalition lady in need of a wonderful #home so you can always email them directly at browndogcoalitionandrescue.com to learn more about #Peekaboo and how you can #adoptnotshop her. If you can’t adopt her, #sponsor her! (Dogs from @montegobayanimalhaven and @browndog_coalition always appreciate sponsorship to help cut their costs of transport from #Jamaica to #Boston.) And remember, #KING is #wheredogsrule. Say hello to Cookie, a 3 month old #puppy! Isn’t he #adorable? Rescued by tourists staying in #Negril, sweet little Cookie found his way to @montegobayanimalhaven for #love, #food, and #shelter. He is one of my best #friends – we laugh and play all day! He loves being pampered, snuggling with his toys, and climbing into your lap to give kisses. Will you #adopt him and give him the #furever #home he wants and deserves? He is ready for some love and attention! If you are interested in adopting him, get at me, dawg! Comment or DM me here or tweet my Mama @kelsey_cruz. 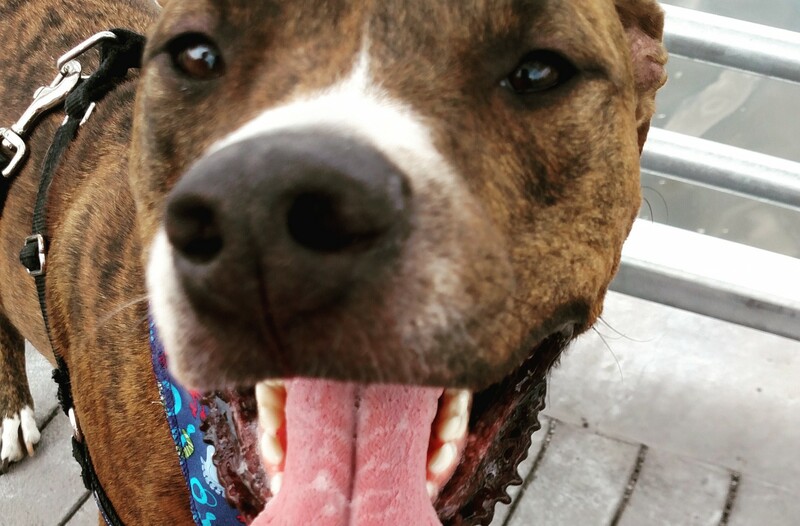 He is a @browndog_coalition boy in need of a wonderful #home so you can always email them directly at browndogcoalitionandrescue.com to learn more about #Cookie and how you can #adoptnotshop him. If you can’t adopt him, #sponsor him! (Dogs from @montegobayanimalhaven and @browndog_coalition always appreciate sponsorship to help cut their costs of transport from #Jamaica to #Boston.) And remember, #KING is #wheredogsrule. Meet Phoebe, Piper, and Prue – my triple P homegirls! Aren’t they #adorable? They’re only 3 months old and hail straight from #Jamaica, mon! They love a good cuddling and relaxing at #home. They’re extra soft and have the most soulful eyes. Once their mom was spayed, they were surrendered to @montegobayanimalhaven to find #furever #homes. Will you give these #girls a chance? They need and deserve a warm, loving home. If you are interested in adopting them, get at me, dawg! Comment or DM me here or tweet my Mama @kelsey_cruz. They are @browndog_coalition babies in need of a wonderful #home so you can always email them directly at browndogcoalitionandrescue.com to learn more about #Phoebe, #Piper, and #Prue and how you can #adoptnotshop them. If you can’t #adopt them, #sponsor them! (Dogs from @montegobayanimalhaven and @browndog_coalition always appreciate sponsorship to help cut their costs of transport from #Jamaica to #Boston.) And remember, #KING is #wheredogsrule. Say hello to #Bunnie and #Bandit! These two #puppies (only 3 months old!) are so adorable, right? They were found last month by a tourist wandering in #Jamaica. Bandit is the big #brother – he’s full of personality but is super protective of his #sister – while Bunnie is sweet as pie and a little more reserved. They are both so lovely and full of life – we have such a good time together; we #laugh and play all day! If you are interested in adopting them, get at me, dawg! Comment or DM me here or tweet my Mama @kelsey_cruz. They are @browndog_coalition #dogs in need of a wonderful #home so you can always email them directly at browndogcoalitionandrescue.com to learn more about ##Bunnie&Bandit and how you can #adoptnotshop them. If you can’t adopt them, #sponsor them! (Dogs from @montegobayanimalhaven and @browndog_coalition always appreciate sponsorship to help cut their costs of transport from #Jamaica to #Boston.) And remember, #KING is #wheredogsrule. Say hello to Margarita, a 9 month old #puppy! Isn’t she #adorable? She was rescued after she was found starving in a neighborhood of #Negril and was taken to @montegobayanimalhaven. As you can see, she has rebounded terrifically and has a great attitude and an optimistic outlook on life. (We #dogs are wonderful like that – we bounce back from adversity and learn to #love and trust again!) Margarita’s beautiful light coloring reflects her easy, breezy temperament – she’s a real gem! Will you #adopt her and give her a loving #furever #home? If you are interested in adopting her, get at me, dawg! Comment or DM me here or tweet my Mama @kelsey_cruz. She is a @browndog_coalition lady in need of a wonderful #home so you can always email them directly at browndogcoalitionandrescue.com to learn more about #Margarita and how you can #adoptnotshop her. If you can’t adopt her, #sponsor her! (Dogs from @montegobayanimalhaven and @browndog_coalition always appreciate sponsorship to help cut their costs of transport from #Jamaica to #Boston.) And remember, #KING is #wheredogsrule. Meet Violet, a 7 month old #puppy! Isn’t she #adorable? She was rescued after she wandered into someone’s yard, and although is feisty, she is #tiny and wasn’t a match for the big #dogs that were eyeing her. Fortunately, she was rescued and brought to @montegobayanimalhaven where she quickly fell in with her own clique. Violet is a smiley, happy girl with a tail that never stops wagging! Will you #adopt her and give her the #furever #home she wants and deserves? If you are interested in adopting her, get at me, dawg! Comment or DM me here or tweet my Mama @kelsey_cruz. She is a @browndog_coalition lady in need of a wonderful #home so you can always email them directly at browndogcoalitionandrescue.com to learn more about #Violet and how you can #adoptnotshop her. If you can’t adopt her, #sponsor her! (Dogs from @montegobayanimalhaven and @browndog_coalition always appreciate sponsorship to help cut their costs of transport from #Jamaica to #Boston.) And remember, #KING is #wheredogsrule. Say hello to Lilli June! She is a #beautiful two year old #dog who is full of wiggles and waggles. She is super #friendly and is eager to please and give kisses. She doesn’t have a ton of leash experience, but she is super smart and willing to learn! Sadly, #Lilli was brought to the #shelter after she had a litter of #puppies that didn’t survive and was found starving. Isn’t that heartbreaking? Fortunately, she is #happy now and ready for a #furever #home. Will you #adopt this darling girl? If you are interested in adopting her, get at me, dawg! Comment or DM me here or tweet my Mama @kelsey_cruz. She is a @browndog_coalition girl in need of a wonderful #home so you can always email them directly at browndogcoalitionandrescue.com to learn more about #LilliJune and how you can #adoptnotshop her. If you can’t adopt her, #sponsor her! (Dogs from @montegobayanimalhaven and @browndog_coalition always appreciate sponsorship to help cut their costs of transport from #Jamaica to #Boston.) And remember, #KING is #wheredogsrule.